Students Emi Smith and Matt Thomas promote All in Week at a table in Starbucks. Photo courtesy of Dori Chandler. In a strategic communications class last semester, students were tasked with creating marketing campaigns to promote religious pluralism and interfaith awareness on campus. This year, the CFV obtained a grant to hold a competition allowing students in the class to execute their programs on campus. As a result, Emi Smith, Zach Falch and Matt Thomas were able to turn their final project into a weeklong campaign. 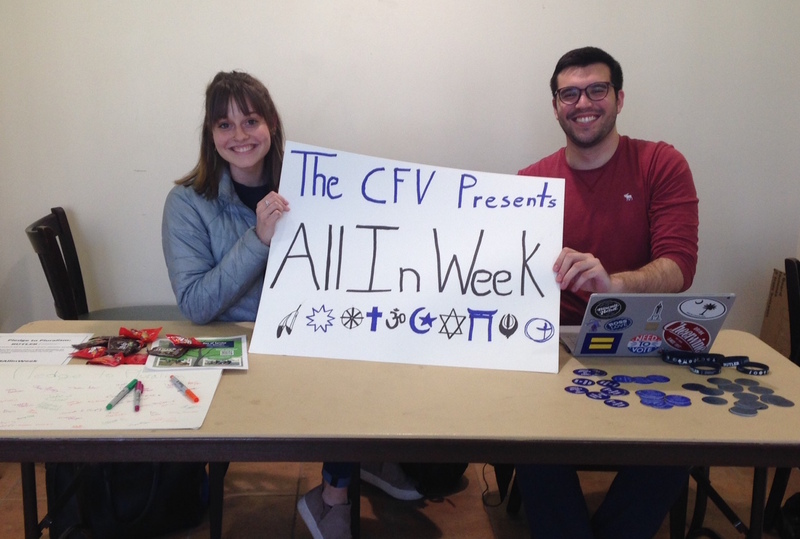 All in Week hopes to expand religious pluralism and understanding during students’ time at college through a variety of programs and activities. Smith, a sophomore strategic communications and political science double major, is a member of the winning group. The events of the week include a poster signing, film screening, interfaith discussion and a community service event. “We decided that with the budget that the CFV gave us the best way to promote their message was to package a lot of speakers, events and different activities into one week of the year where they could heavily target students,” Smith said. In August 2015, first-year students took the IDEALS survey, a questionnaire that assessed the predominant faith identities on campus, along with race, gender and class identities. Students took the survey a second time during the 2016 spring semester in order to determine how one year of college might have impacted their views. “The first round showed us that the students coming in to Butler generally have a slightly lower than average appreciation for most identities aside from Evangelical and Conservative ideologies,” said Daniel Meyers, director of the CFV. This included minority categories like Muslims, transgender people, liberals and atheists. After receiving the results for the second survey, taken a year later, Meyers discovered that Butler students’ views were more or less concurrent with national data. The first-years who initially took these surveys are now seniors, and they received their final survey on March 18. The results of the last round will most effectively determine how the college experience impacts individual views on religious identities and differences. The group of Butler students putting on All in Week found out they won only about a month ago, which meant they had a relatively short amount of time to execute their plan. Smith said she was unfazed by this, as she saw the entire process as something that would ultimately benefit her.